There are shows featuring an ensemble of different character types, specifically designed to play off each other. Of course to diversify the main cast, there's bound to have a cynical Goth girl among them. 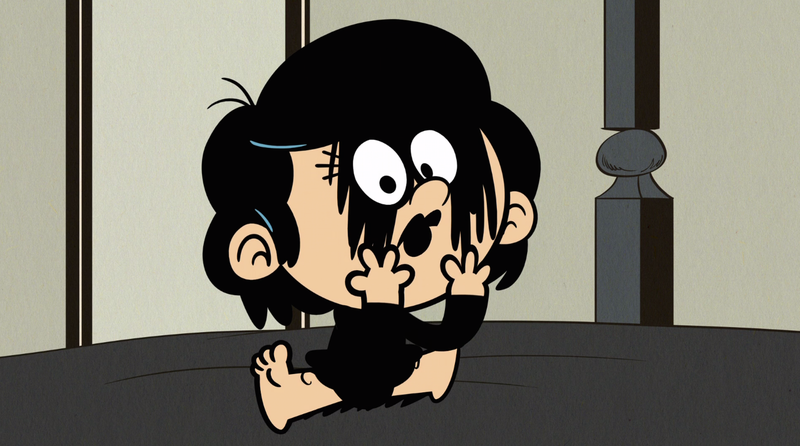 Lucy Loud from The Loud House. In the art style of newspaper comic strips, the series revolves around the chaotic everyday life of a boy with ten sisters. Each sister has her own defining quality or trope, from ditzy to sporty, from geeky to goth. Lucy is 8 years old, and the seventh of the Loud Siblings. Contrary to their family name and the rest of them, she is the quiet and gloomy one. A running gag is her uncanny ability to teleport to different places, which often spooks her siblings. She claims the attic as her secret dark space, talks to ghosts, writes Gothic poetry, and sleeps in a coffin along with her pet bats. She pines for a fictional vampire named Edwin, and possesses a bust of him. 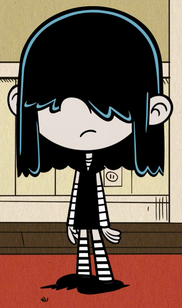 Lucy once turns their littlest sister Lily into a literal babygoth. Kylie from Extreme Ghostbusters. This 1997 series was made after the 1986 animated "The Real Ghostbusters." Dr. Egon Spengler recruited new and younger members. 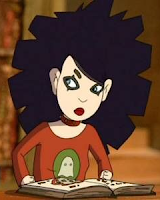 One of them is Kylie Griffin, a Goth girl genius and of course, an expert of the paranormal. She usually wields the Ghost Traps, and claims to be the unofficial leader on the field. She's usually the calm one among her teammates, and keen towards their ghost-busting job. But she's grossly afraid of maggots. It's implied that Kylie's Goth mode is due to the death of her grandmother Rose, whom she talks to from time to time. Finding out what happened to her after she passed on is perhaps Kylie's main motivation as a character. Cassandra from Hercules: The Animated Series. The mythological Cassandra is a Trojan princess whom Apollo loved fervently that he gave her the gift of prophecy. But after she rejected him, he put a counter-curse that no one will ever believe her. This is kept in the cartoon adaptation with a Goth twist: Cassandra only predicts the worst things to happen. She usually stays in a trance with spinning eyes and chants her prophecy. Since no one would believe her, she becomes asocial and only friends with the outcasts, Hercules and Icarus. 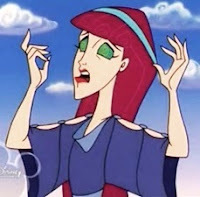 A running gag is that when Cassandra makes sarcastic comments, Hercules and Icarus listen, but when she has visions, they rarely believe her. Crimson from Total Drama Presents: The Ridonculous Race. 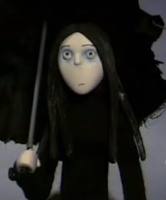 She and her Goth equal and boyfriend, Ennui, are contestants of this Amazing Race parody. Though it is uncertain as to why. Crimson is described to have the emotional range of a stone gargoyle, and tend to scare other competitors. They especially enjoyed their trips in Transylvania, Iceland and Finland (where Goth is mainstream). When she and Ennui are de-gothed, both are shocked to see each other in their true preppy forms for the first time. Yet they look pass appearances, and strongly love each other because "it's the blackness deep down inside that counts". Onyx Von Trollenburg from Trollz. The crazy-haired dolls from decades past are rebooted in this fablepunk cartoon series about five young troll girls with enchanted gems on their belly buttons. With their magic, they battle forces of evil while dealing with typical teenage life. 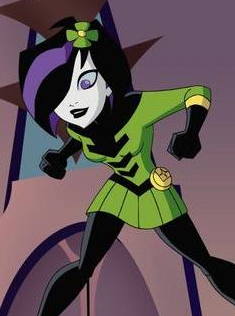 Among the color-coded girls, Onyx is the friendly Goth of the group. She owns a dark violet gem (her namesake), shaped like a crescent moon. Her Ancient is Spinell, old Zirconia's husband. 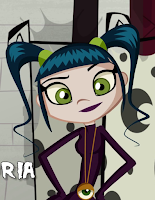 Being a Goth, she's quick-witted and headstrong, especially towards cheerleaders and guys standing on her way. 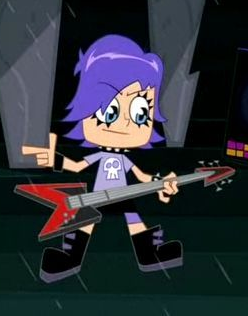 She's introverted and only keeps her four friends, and her love interest is a poetic rocker named Flint. 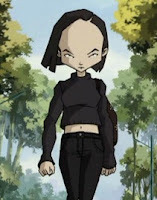 Yumi Ishayama from Code Lyoko. Tough as nails but with a heart as soft as a plum, Yumi has a traditional Japanese upbringing. Her natural charisma has friends looking to her as the leader of the group. Though often seems distant and cold, her outward appearances belie a generous, sensitive and loyal friend, which she only lets people see on rare occasions. In the virtual world of Lyoko, Yumi is a profound gymnast and martial artist with unimaginable capabilities. Her choice of weapon is a pair of sharp metal fans, and she has the power of telekinesis. Misery from Ruby Gloom. 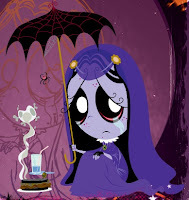 While the titular character is the epitome of a perky Goth, Misery is the melancholic banshee of the Gloomsville Manor. Her mishaps are usually a combination of clumsiness and extraordinary bad luck. Fortunately, her friends are all kindhearted enough to take this in stride. Misery spends most of the time in a state of detached apathy and with ever-present trails of tears running from her eyes. She does have moments of happiness from time to time, especially during Friday the 13th, when only good things happen to her. Yumi Yoshimura from Hi Hi Puffy Ami Yumi. The series follows the adventures of two pop stars and best friends: Ami Onuki, the peppy, optimistic, and cutesy drummer, wearing '60s mod; and Yumi Yoshimura, the cynical, sarcastic, rough, and tough punk rocker. Both are based off the real Japanese pop duo Puffy AmiYumi, but with cartoonized looks and exaggerated personalities. Yumi loves food a lot, messing around, ninja action, and monster trucks. She was raised to have an operatic voice, but rebelled to pursue heavy rock music. Yumi does not claim her self to be Goth; but with those wicked eyes and boots, and non-establishment attitude, she wins the dark admiration of alternative fans. Shrinking Violet from Legion of Super Heroes. Also known as Salu Digby, LeViathan and Atom Girl, she has the ability to vary her size, especially into microscopic levels, just like her people in planet Imsk. With this unique ability, the Imskians are experts in biotechnology and micro-circuitry. As for Shrinking Violet, she's an expert in transneural photonics and sabotage. She fails her first audition in the Legion of Super Heroes due to her extreme shyness until Triplicate Girl gives her enough self confidence. She becomes notorious for her weird laugh, and a love interest to Brainiac 5. 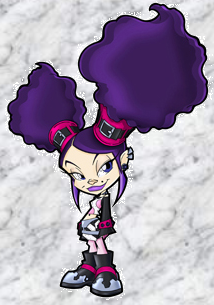 Violet first appears in a black and dark pink costume and frizzy hair, but after she sabotages the Emerald Eye, she dons this cybergoth look. Aldous from What's It Like Being Alone. This stop-motion cartoon is about a dysfunctional family of freaky children in Gurney Orphanage desperately trying to get adopted. Being the eldest and most composed, Aldous is often given responsibility over their welfare when Nanny Goodapple is out. Though she denies any emotional attachment to her fellows, she truly cares, and even saves them from the witch. Aldous is deeply depressed, pessimistic, and obsessed with her own death. She is always seen under the shades of her parasol, even indoors, and carries around a spiked purse that she uses as a mace. Hanna from McTucky Fried High. A web series that tackles LGBTQA topics such as gender identity, coming out and bullying, with anthropomorphic food as characters. Also, it has delightful food puns. 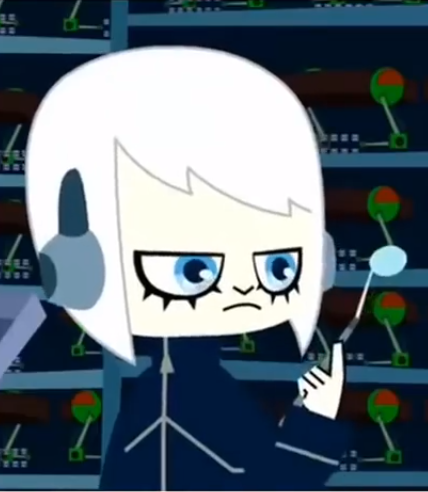 Hanna is a lesbian Goth and member of the Feminist club. 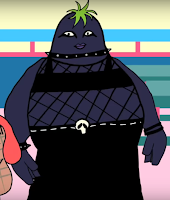 Though she's as mighty as an eggplant, she has a gentle heart, yet vulnerable to the bullies' fat shaming, which pushes her to literally slice off her weight. She then goes to find herself, and returns to support her dear friend and now girlfriend, Blue the blueberry. Victoria from Scary Larry. 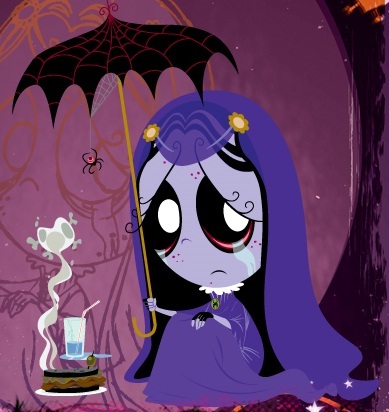 The cartoon series is based on the Goth-beloved comics Little Gloomy. In Frightsylvania, Gloomy is friends with Larry the werewolf, Carl Chthulu, Frank and Mummy. However, when they are adapted into television, Larry takes the center spot and forms a rock band with them called the Insomniac Babies, with Victoria as their vampire lead singer. Gloomy might have been her expy, since they have the same dark blue pigtails, yet Victoria is petite and sassy compared to Gloomy. Janice Kawolsky from Creepschool. When four unsuspecting kids attend a remote, sinister-looking boarding school known as the Creepschool, they embark on an adventure into the fascinating, supernatural world. That would have been delightful for us Goth kids to attend to. 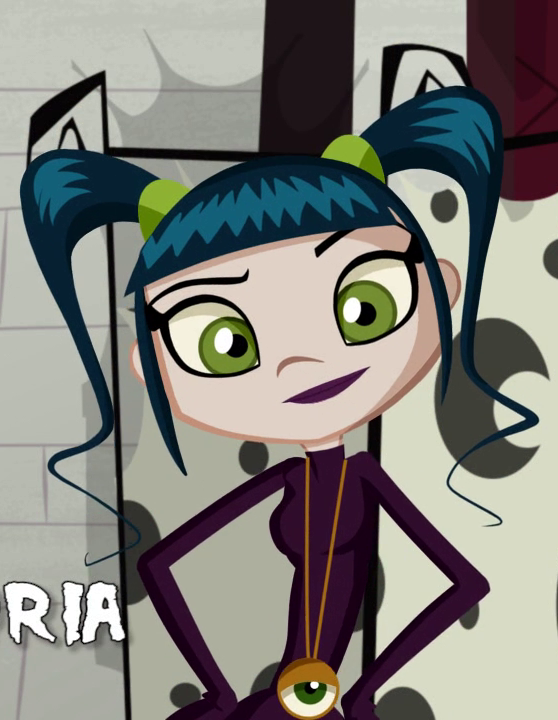 Even wearing cargo shorts, Janice still strikes off as the Goth of the group, especially with that creepy-cool make-up. She is the total opposite of girly blonde, Victoria. And it's no wonder, because Janice's ancestor was a rebel fighting Victoria's noble ancestors. She likes to be alone with her books, yet also likes exploring the supernatural with her friends. Ironically, she's rational enough not to believe in superstitions. Zero from I.N.K. Invisible Network of Kids. The titular organization is created by four students of Pinkerton Boarding School to thwart the evil plans of the cruel Ms. Macbeth. Tall and mighty, Zero is the big-hearted rebel of the team, and the main fighter during missions. She is always seen with her headphones on, both for music and for communication with I.N.K. She is quite intimidating and rash, yet she cares for her friends and experiences awkward moments with Vin. Hey, what about Voltaire's "Chi-Chian"
I think you don't know any different beetwen goths and emos Do you?! The problem with television and movies is they stereotype subcultures, like goth and emo where there's a blurred difference between them. Hence, some of these characters seem to be borderline emo, yet I still acknowledge them for their penchant for the dark and gloom. From time to time, my friends and I review the lists. We'd say, "Hey, this one is more punk than Goth," or "she's just wearing black, but not really showing any Gothic attributes", etc. So, I'd delete some and add some. Actually, thank you for reminding me about Birch.